Do you want to create a referral program in WordPress? Referral programs are a great way to get more people to promote your products to a larger audience. In this article, we will show you how to easily create a referral program in WordPress and get more customers. Why Create a Referral Program in WordPress? Referral program or affiliate program allows you to get more people to help you sell your products and services. In return, you pay them a small commission on each sale they make. For more details, see our ultimate affiliate marketing guide to see how it works. In simple terms, it is like building your own sales army without paying them a salary. These affiliate marketers use tools and plugins to create marketing content. They make money online by referring their users to right products and services. To manage a referral or affiliate program, you will need a tool that can manage your affiliate program. It will allow affiliate marketers to join your referral program. It will also help you track sales and traffic sent by each affiliate partner. Why Use AffiliateWP to a Create Referral Program in WordPress? For this tutorial, we will be using AffiliateWP plugin to create a referral program in WordPress. It is one of the best affiliate management plugins for WordPress. Like everything else in life, AffiliateWP has it’s own pros and cons that you should consider. 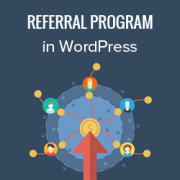 Following are some of the benefits of using AffiliateWP to manage your referral program in WordPress. Very easy to use and blends in your WordPress site like a native app. Very cost effective with plans starting from $99/year to $499 for a lifetime license. Here are some of the disadvantages of using AffiliateWP to manage your referral program. It does not come with advanced fraud detection features that are offered by popular affiliate networks. Does not calculate taxes and 1099 forms for payouts. As a business owner, you will have to manage it on your own. It is less convenient for affiliate partners. They will have to create an account and login to view their reports, compared to affiliate networks where they can see all their earnings at one place. A good alternative to AffiliateWP would be ShareASale, which is a large affiliate network with thousands of skilled affiliate marketers actively looking for new products to recommend. For a more detailed comparison, you may want to see this article on setting up your own affiliate program by Syed Balkhi (Founder and CEO of WPBeginner). 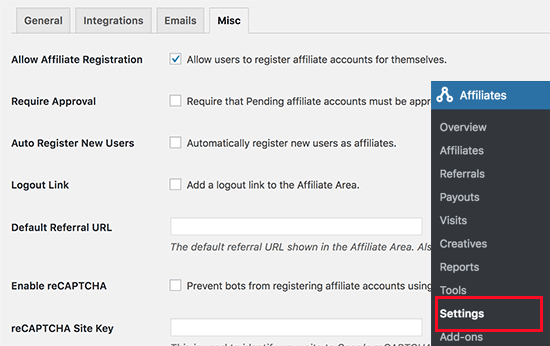 With that being said, let’s take a look at how to create a referral program in WordPress using AffiliateWP. First thing you need to do is install and activate the AffiliateWP plugin. For more details, see our step by step guide on how to install a WordPress plugin. Upon activation, you need to visit Affiliates » Settings page to enter your license key. You can find this information under your account on AffiliateWP website. 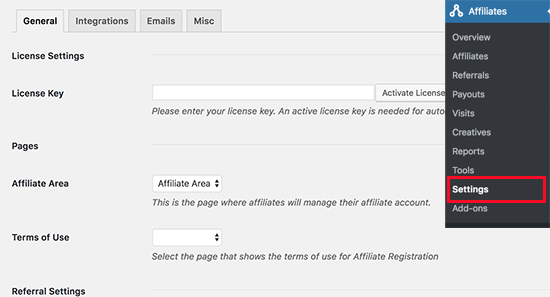 After activating your license key, you need to select a page to be used for Affiliate Area. AffiliateWP automatically creates one for you, but if you want to use a different page, then you can select it here. Next, you need to choose the terms of service page. You can check out affiliate program terms pages on other websites to create one for your own site. After creating the page you can select it here. After that, you need to review other settings on the page and set them up based on your own referral program policies. Next, you need to switch to the integrations tab on the Settings page. From here you need to select the integrations you want to enable. 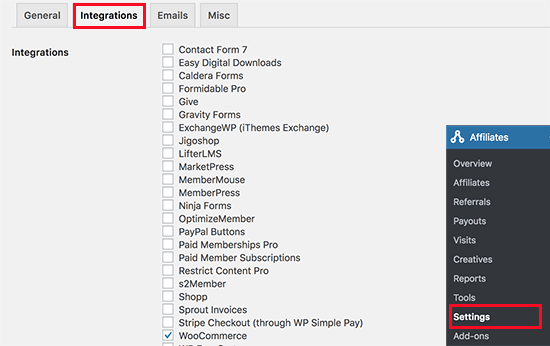 AffiliateWP supports most popular eCommerce, membership, contact form, and LMS plugins. Click on the save changes button and then switch to ‘Emails’ tab on the Settings page. 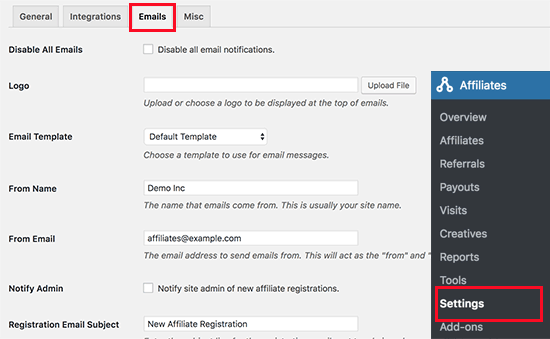 AffiliateWP allows you to edit emails sent out to your affiliates. You can also upload your business logo, create your own email templates, and choose the email address you want to use to send out affiliate emails. Note: If you are unable to receive email notifications, then follow our guide on how to fix WordPess not sending email issue. Lastly, switch to the Misc tab on the settings page to set up advanced settings for your affiliate program. The first option on the page is to allow affiliates to register themselves. You can check this if you want affiliates to be able to sign up for your referral program. Next, you would also want to enable reCAPTCHA to prevent bots from registering as affiliates. You will need to carefully review each setting and change them as needed. Don’t forget to click on the save changes button to store your settings. Now that you have set up your referral program, the next step is to add links to it. For example, if you have enabled affiliate registration, then you may want to add a link to affiliate area so that interested marketers can register themselves. Simply go to Appearance » Menus page and add your affiliate area page to a navigation menu. 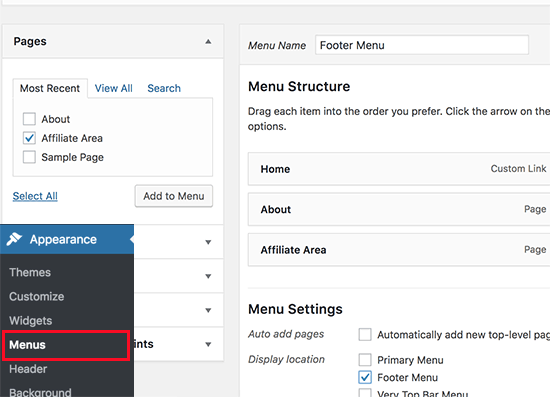 For detailed instructions, see our beginner’s guide to adding navigation menus in WordPress. 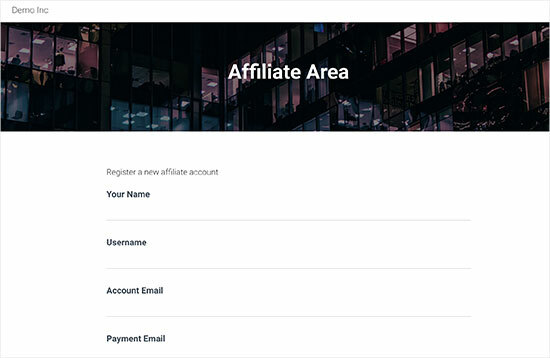 Clicking on the link will take users to the affiliate area where they can register to join as a new affiliate, or login to their account to see their reports. AffiliateWP comes with powerful tools to manage your affiliates, view reports, and effectively run your affiliate program without leaving WordPress. To view affiliates that have joined your referral program, simply go to Affiliates » Affiliates page. On this page, you can see a list of all your affiliate partners, their earnings, unpaid earnings, referral visits, and more. You can edit any affiliate account individually. To view each sale made through a referral partner, you need to visit Affiliates » Referrals page. Here you will see all referral sales, affiliate partner, amount, and more. You can also click on ‘Reject’ link if you suspect a referral to be fraudulent. 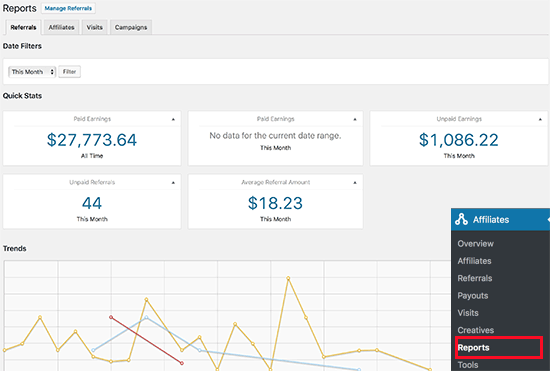 Reporting is crucial to run a successful referral program, and AffiliateWP comes with powerful reporting features. Head over to Affiliates » Affiliates page for a full overview. You can filter the reporting period by time and specific affiliate partner name. 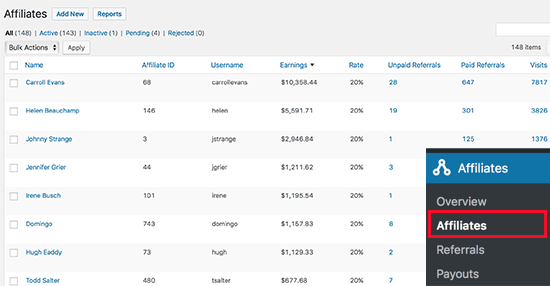 You can also view reports for affiliates, referral visits, and campaigns. Unfortunately, AffiliateWP doesn’t come with automatic payouts, which means you will have to manually send payments. AffiliateWP makes it easy to manage your payouts. 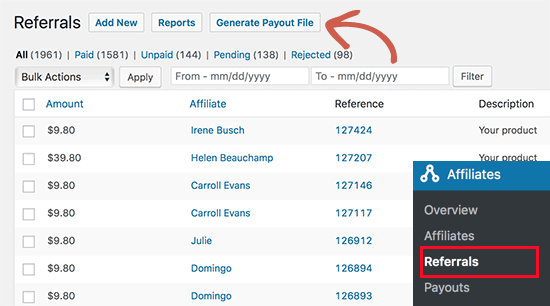 Depending on when and how often you want to pay your referral partners, you can head over to the Affiliates » Referrals page and click on the ‘Generate Payout File’ button. This will generate a payout file which is compatible with PayPal’s mass payment system. The file also works with Skrill and other payment services that support mass payment feature. It contains the amount and payment email addresses for all your unpaid referrals. 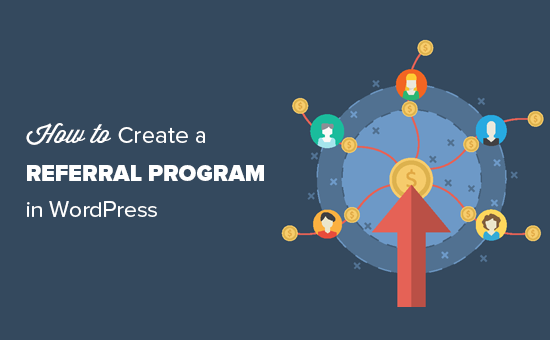 We hope this article helped you learn how to create a referral program in WordPress. You may also want to see our ultimate step by step WordPress SEO guide for beginners. Please how to i make users see the username of the people they’ve referred? You would want to check with the support for the affiliate plugin you’re using for if that is an option. Thanks for this. I never knew this feature was available in WordPress. I should have known! WordPress have everything. Love it. I appreciate all your step-by-step tutorials here on this blog. Been reading for a while but rarely comment. Thanks.